MINI Cooper Acccessories + MINI Cooper Parts :: OutMotoring.com MINI Blog :: MINI Accessories :: No one can lock you down. Synopsis: Even your locks have wings! Beautifully crafted set of 2 Wing-Shaped Door Lock Accent Badges are a welcome addition to any Gen1 or Gen 2 MINI. Details can have a high impact on the interior of your MINI. 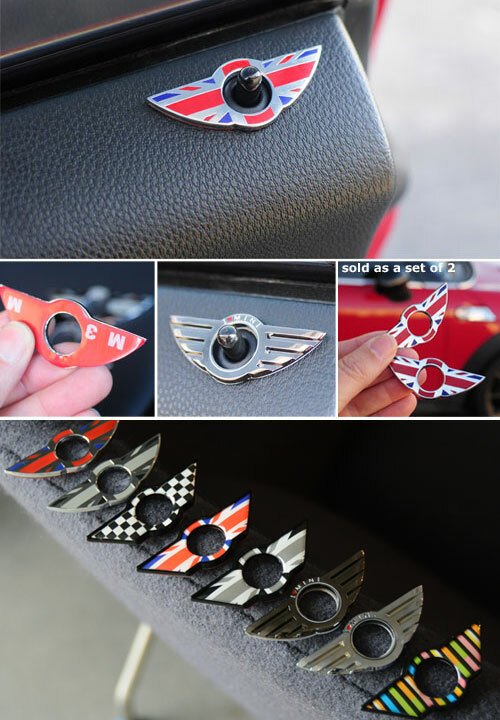 These simple peel-and-stick badges install in seconds and make for a super easy and affordable upgrade the interior of your MINI. Comments on No one can lock you down.